9 Best Dim Sum Places In Singapore That You Won't Feel Guilty Splurging On! Dim Sum is a style of Cantonese cuisine where bite-size portions of food is traditionally served in small steamer baskets. There are heaps of Dim Sum stores that have popped up around our island, widening our choice of options for this specific cuisine. 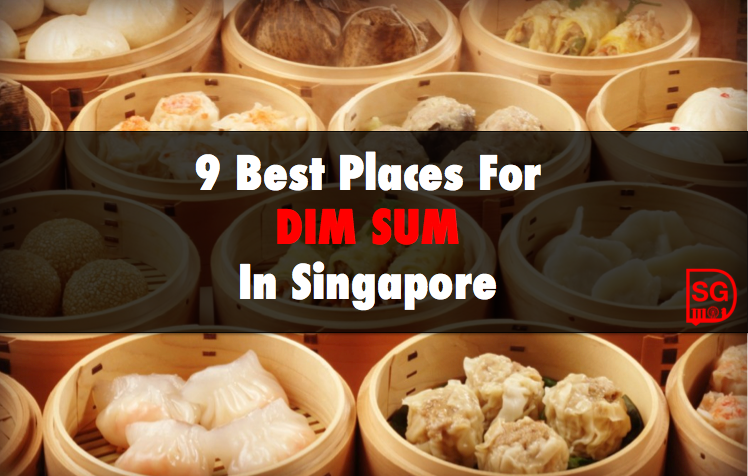 To simplify your job of choosing, here’s a list of the 9 Best Places for Dim Sum in Singapore. Located 5 minutes away from convenient Chinatown MRT Station, Tak Po features Hong Kong dim sum and homestyle Cantonese cuisine at affordable prices. Their porridge has a very smooth texture to it, and they are absolutely not stingy with the toppings. A budget of $20 will well fill your tummy’s needs. A Cantonese restaurant located at the 6-Star St. Regis Hotel, Yan Ting is famously notable for its Weekend Dim Sum Buffet. At $98++ per person (or $138++ for an alcoholic option), dining here will leave you brimming with options ranging from high caliber dim sum to comforting Cantonese favorites. Yan Ting promises to not disappoint. Food here is also served at a swift speed to ensure you’ll never have to wait long. Do remember to make your reservation in advance to avoid disappointments! A store that features a quaint and rustic atmosphere is Hua Nam, a traditional store selling cheap and delicious Dim Sum. They offer the usual dim sum dishes like Har Gao and Siew Mai, all of which are worth the price you pay. Besides offering dim sum, Hua Nam also sells Tze Char, offering a variety of options for all its customers. As one of the pioneer Dim Sum restaurants here in Singapore, Red Star serves up some extremely delicious dim sum in an authentic setting. The concept is highly similar to Hong Kong Dim Sum halls, where waitresses serve food by pushing around old fashion carts. When you’re there, do try their Char Siew Sou – a chinese delicacy with a buttery and flaky crust filled with a moist Char Siew center. The restaurant does not accept reservations, so remember to arrive early to avoid their famously long snaking queues! Victor’s Kitchen should be a very familiar name to all Liu Sha Bao (custard bun) lovers out there, as the restaurant constantly tops food lists for offering one of the best Liu Sha Bao in Singapore. Their other dishes such as the Carrot Cake With XO Sauce and Victor’s King Prawn Dumplings are pretty delicious as well! The atmosphere closely resembles the small and cozy Hong Kong dim sum eateries, which comes as no surprise since the head chef himself hails from the land of Dim Sum. Yum Cha continues to remain as one of the popular restaurant icons in Singapore. The food here is moderately priced, and the ambience is classy yet traditional. The service is impeccable as well, with all the servers paying close attention to your every need. Food is also served very quickly within a very short span of time. 126 Dim Sum at Sims Avenue serves both delicious and affordable food. Besides selling the usual favourites, this eatery also offers some very creative items like Tom Yum Siew Mai and Curry Chicken Chee Cheong Fan. Besides Dim Sum, they also offer a range of dishes like Thai-style Fried Crab Dong Fen and White Pepper Crab Bee Hoon that is typically offered till 8pm. Mongkok Dim Sum is no stranger to those living in the East of Singapore, as all 4 of their outlets are located within this region. The Dim Sum offered here is not only of high quality, but is affordably priced. They are well known for their Har Gao, also known as the House Special Shrimp Dumpling, where succulent and fresh shrimp chunks are wrapped with a translucent dough skin. Another popular shrimp dish is Mongkok’s Steamed Rice Roll that is of the perfect thickness, served with its delicious accompanying soy sauce. Ending the list is one from the Paradise Group family – Canton Paradise. Canton Paradise is one of the more family friendly restaurants on our list, with numerous branches spread all around the island. The Radish Cake, and Century Egg Porridge With Lean Meat are extremely delicious, and leave you coming back for more. Let us know in the comments where your favorite Dim Sum eatery is!